The WTI crude prices continued to slump yesterday, losing $0.51 to $99.22 per barrel, defying the increasing tensions in Eastern Europe. Along with the record US oil supply, China's manufacturing figures indicated a slower than expected growth, which added further downside pressure on the energy complex. Gold maintained its southward trajectory, dropping $6.9 to $1,284.8 as the Fed continued trimming the pace of bond buying, $10 billion cut to $45 billion. The fact it was also acknowledged the economy picked up recently, is another bearish feature for the precious metal. In its weekly crude inventories report, the US Department of Energy indicated a 1.7 million barrels rise to a record high of 399.4 million barrels. That is the highest level since records begun in 1982 and pushed WTI crude prices $1.06 lower to $99.70 despite a weaker dollar which usually acts as good support. The Federal Reserve's optimistic tone about the economic outlook hit the precious metals yesterday as investors shifted their cash into higher yielding assets. Although the gold market is up for the year due to the conflict in Ukraine and some early stuttering in the US, it dropped $4.3 yesterday to end at $1,291.4. As the US and European Union extended sanctions against Russia yesterday, WTI rallied reaching above $102 at some point in intraday trading. However, estimates that crude inventories in the US are at an 83 year high took their toll on the oil prices, pushing the market back down in afternoon session, ending $0.16 in the red at $100.73 per barrel. Initially, gold rose with crude oil on an escalating crisis in Ukraine, breaking above the $1,300 mark. But later on, a rally in equities reversed trend for the precious metal which ended rather flat for the day at $1,296 as investors went for higher yielding assets. The usual suspects, a lower dollar coupled with a rally in equities, pushed crude oil prices higher yesterday. This allowed for a small rebound after Friday's sharp decline, with WTI settling $0.32 higher at $100.88 amid speculation that inventories at Cushing, Oklahoma declined last week. A surprise rise in US pending home sales, which posted its first monthly rise after eight months of declines, pushed gold prices $7 lower to $1,296.3. Traditionally, good news regarding the economy doesn't bode well for precious metals as they crimp demand for safe harbour assets. 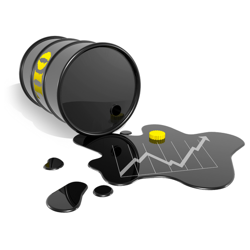 A slump in equities drove the energy market lower with the WTI losing $1.29 to finish at $100.64 per barrel. That raised questions of a challenge at the psychologically important $100 mark. Massive crude oil inventories in the US point towards that but so far overnight, if anything we saw a rebound to $101 level. Demand for safe haven assets kept gold prices on an uptrend trajectory with the yellow metal breaching above the $1,300 mark. The market rallied $8.4 to $1,302.3 and seems on course for further gains. As we saw at the start of April, failure to break below $1,280 attracted a recovery.